oh, thanks, so I guess I did have the real film. Eward is right. Really freaking funny. I really just cherish my region 2 dvd of weekend. my town's cable actually added TCM. Les Carabiniers airs June 3rd at 1am Central Time. In case someone needs reminded. i recorded it vhs style. What must I do to get a piece o' that? i figure by the time i find a vcr to dub with, the purchase of a blank vhs tape, mail packaging, and cost of shipping that you could probably buy the Fox Lorber edition for about the same and get a bonus commentary. edit: well, i thought it was 8.99 just like My Life to Live. you might look to see if there are used copies floating around somewhere. 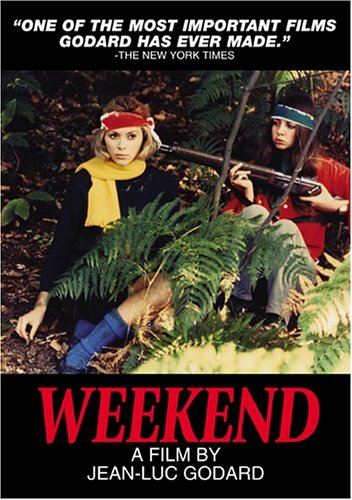 word on the street: Weekend gets released by New Yorker on June 28th. I went and pirated it off a VHS (I normally don't pirate, unless there's no DVD release) so I'm going to keep my eyes open for this. New Yorker = PAL to NTSC transfer, probably, but its better than nothing I suppose. August 23rd now I guess. i like my region 2 cover better. stupid question perhaps, but then this was my first Godard: did the extension (sequel) get made?